Please note that clear PVC pipe has a slight blueish / greyish hue and so should not be expected to be 100% optically clear. Clear pipe and it's fittings are often used for sight glasses, process inspection and demo or prototyping units. Other clear Tee fittings are available up to 8". EVICLEAR WRAS Approved 1/2" Clear Tee. Designed to take 1/2" Pipe - which has an outside diameter of 21.4mm. EVICLEAR WRAS Approved 3/4" Clear Tee. Designed to take 3/4" Pipe - which has an outside diameter of 26.7mm. EVICLEAR WRAS Approved 1" Clear Tee. Designed to take 1" Pipe - which has an outside diameter of 33.4mm. EVICLEAR WRAS Approved 1 1/4" Clear Tee. Designed to take 1 1/4" Pipe - which has an outside diameter of 42.2mm. EVICLEAR WRAS Approved 1 1/2" Clear Tee. Designed to take 1 1/2" Pipe - which has an outside diameter of 48.3mm. WRAS Approved 2'' Clear PVC Tee. Designed to take 2" Pipe - which has an outside diameter of 60.3mm. 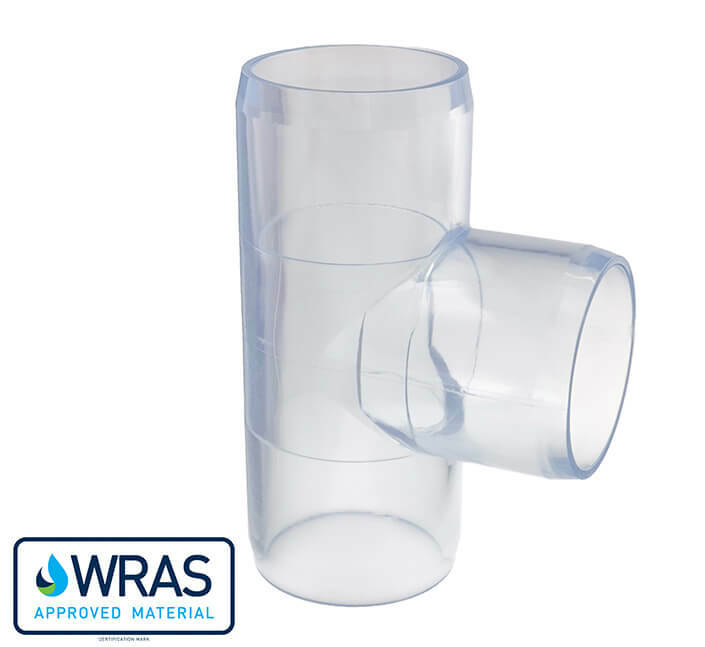 WRAS Approved 3" Clear PVC Tee. Designed to take 3" Pipe - which has an outside diameter of 88.9mm. WRAS Approved 4" Clear PVC Tee. Designed to take 4" Pipe - which has an outside diameter of 114.3mm.